Using the Gear icon at the top right of the portal, click on “My Organization” to access My Organization settings. 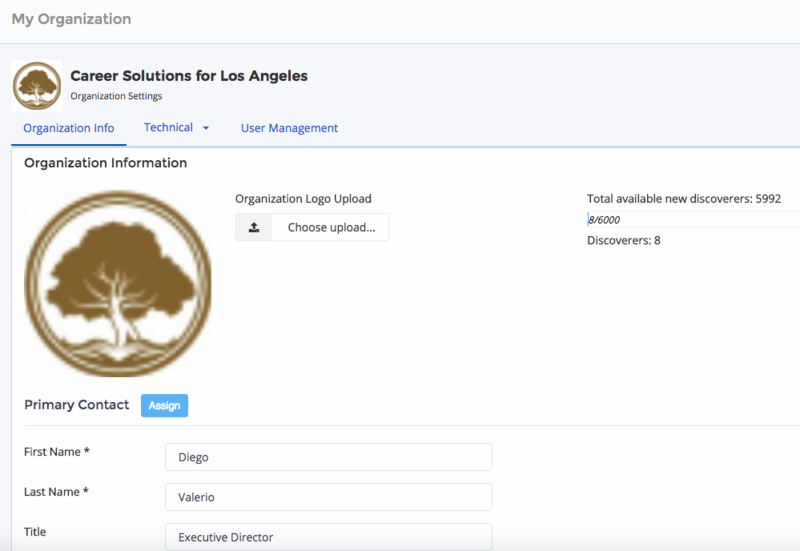 You can personalize your group portal dashboard, invite your colleagues and manage the CKD plug ins your discoverers use to take the assessment. 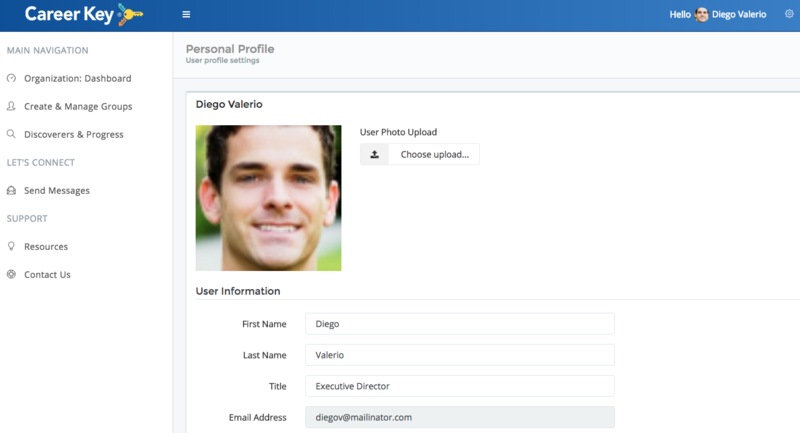 Personalize your account further by updating your Personal Profile with your name, job title, and a photo. Learn how to manage your organization’s information, users, and Career Key Discovery plug ins through which your discoverers’ access the assessment. Update this section with your organization logo to personalize Career Key Central for your organization’s team. You can also update your primary contact at any time. At a glance, you can also see the available discoverer quantity for your organization. This shows how many more of your discoverers can access Career Key Discovery. Your organization’s country and language is set by your sponsoring organization (see Account Hierarchy). These selections don’t impact the language in which your discoverers take the CKD assessment. That’s determined by the subscription assigned to your organization and the technical configuration for your CKD plug in. 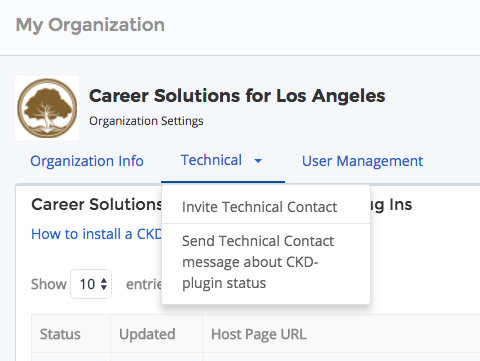 This section shows your organization’s Career Key Discovery (CKD) web app plug in(s). It’s used in two main ways. An organization’s website administrator/technical contact creates and configures a plug in for your website. They will host the plug in on one of your website pages. See How to Install a CKD Plug In. Organization users can see the host URL where their organization’s plug ins are located, and their status. If you don’t see any plug ins yet, invite your technical contact using User Management. You can use the Technical tab menu to do that, and to send a message to that person if you have a question about a plug in’s status. We recommend that only your website administration or technical contact make changes to the Technical section. Once the plug in is installed, discoverers will be able to access CKD, and their assessment results and data will appear in your Career Key Central dashboard. Users invited to a sponsored organization can only see that sponsored organization’s users and discoverers information. The only exception is the default sponsored organization for a customer account (see Account Hierarchy). 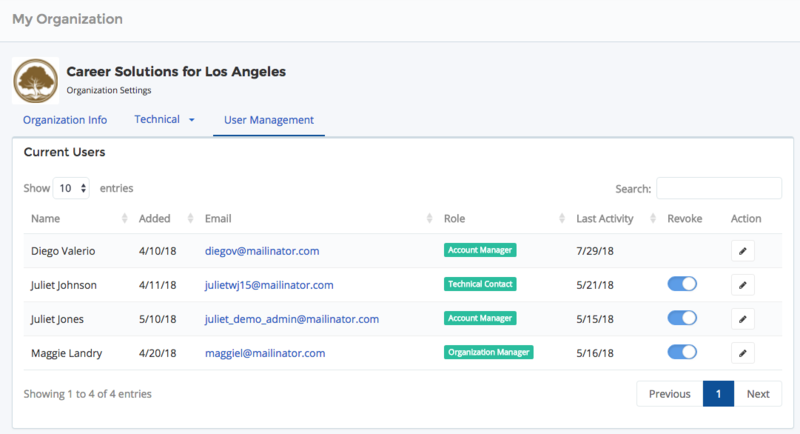 If you see “Account Administration” as an option on your gear menu, you’re a user on a customer-level account and that customer’s default sponsored organization. You have access to subscription management and billing, and can create additional sponsored organizations. If you only see “My Organization” as an option on your gear menu, you are a user for a sponsored organization only. Note: an invited user will not show up in user management until they have accepted the email invitation to activate and create their account. You can update a user’s name and email address if needed. If you revoke a user, you will need to re-invite them and they will need to accept before you can re-establish their access to Career Key Central. Personalize your account further by updating your Personal Profile settings . You can update your name, job title, and a photo. Click on “Update” to save changes.